I had grand plans to get a whole bunch of sewing done during Christmas break, but family time then some other life stuff got in the way, but I got in a good full day today plus another half day of sewing yesterday before the end of 2015. First, I took my blue American Duchess Antoinettes, and fabric dyed them Tiffany blue...well, I 'tried' to dye them Tiffany blue: they came out a little more green then blue, but I think they're pretty, so it's fine. 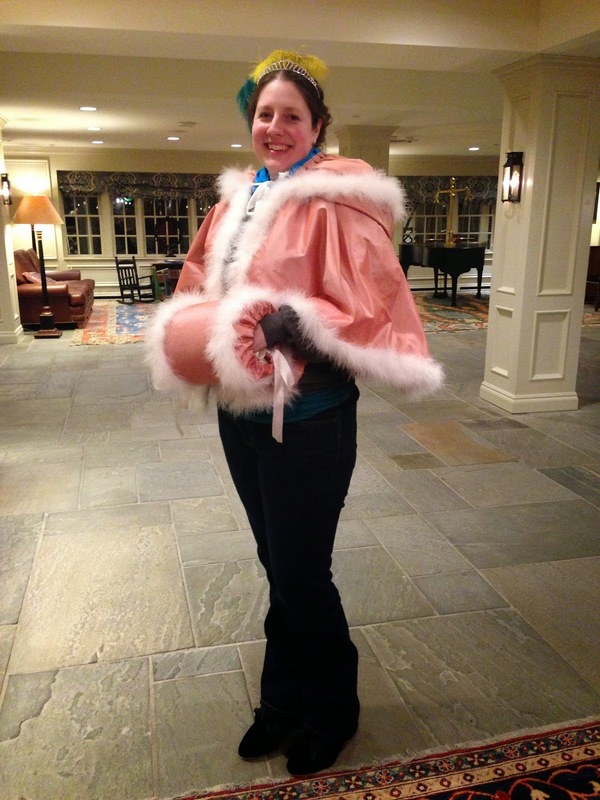 I also sewed white marabou around the edges, to make them really fun. I still plan to do a little more with painting the heels later, but otherwise they are done! Next up, I created two little face masks for my husband and I - I needed a little project on the half day sewing when I was still not quite full energy, so I decided to create these from some scraps/leftover fabrics, and even cut a little into a very soft silk for the insides. For some reason I adore making things from tiny scraps of fabric: it feels like I'm doing what they used to do, because I'm sure they did the same! And I also made more progress with the black fleur-de-lis men's waistcoat: it's all put together now and just need buttons/buttonholes, so I'm calling it done for now (since it can pinned for wear). It's made from a black with gold fleur-de-lis poly fabric, lined with thick black cotton and the back fabric is a thicker silk taffeta. I also spent some time prepping my Edwardian skirt for Saturday: it needed fastenings and a gathering channel, so I knocked that out too. 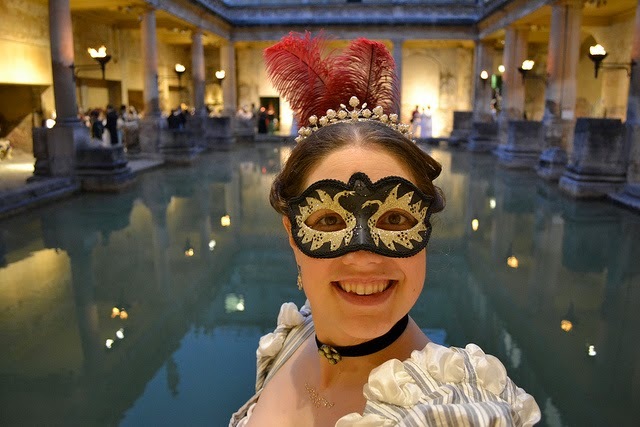 For December's Re-Do challenge, I decided to finish the year much the way it started, with another item for the 'foundation' of my mourning wear wardrobe a re-do of January's HSM challenge: a late 18th century black silk mourning cape. 2015 began with my mother-in-law passing away and my January HSM 'Foundations' challenge turned into a black silk mourning muff, the foundation for a mourning wardrobe. 2015 was a rough year, lots of meh to family and friends, unfortunately a lot of death & major health issues. I thought it was most appropriate to end the year with a mourning cape, as I recently lost another, a dear friend, Barbee. 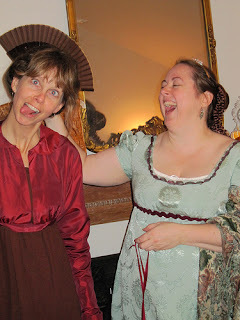 Here are some of my favorite pics of fun times together. Barbee & her hb - fun sense of humor! In tribute to Barbee, who was a dear woman, a great friend, a loving mother to twins and a loving wife to Jim. Her family & friends all mourn her passing. The Challenge: Re-Do: It’s the last challenge of the year, so let’s keep things simple by re-doing any of the previous 11 challenges. For this challenge, I hand-sewed a black silk mourning cape, trimmed in black silk ribbon. It ties at the neck with a bit of black silk satin ribbon. This was a re-do of my January challenge, 'Foundations' or the foundation of my mourning wardrobe. Fabric: black silk taffeta from L.A. Fabric District. Pattern: my pattern (the late 18th century cape I drafted/draped). Year: late 18th century, circa 1770's. Notions: about 14 yards of black silk ribbon. How historically accurate is it? Pretty perfect. 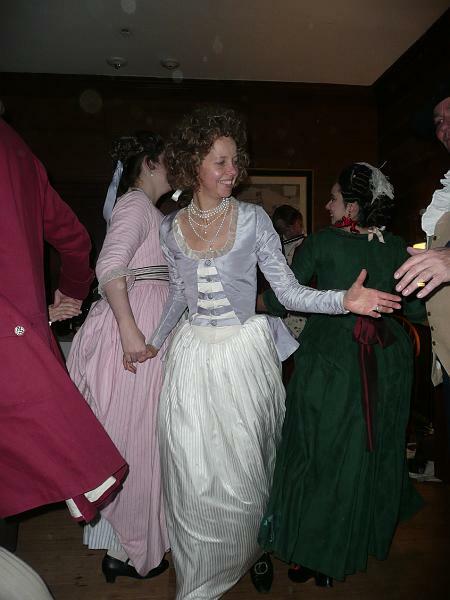 Black linen and black silk taffeta, and black silk trim all very period appropriate. It was hand-sewn entirely, including trim. The only portion not hand-sewn is a small stitch that doesn't show inside the bias binding that held the lining and fashion fabric together. Hours to complete: 2 hours or so to cut out & piece together the lining (not enough of the linen). Another hour to pin and machine a tiny seam allowance. Another few hours to mark, cut & iron bias binding, pin it on then sew it on by hand. Quite a few hours to pleat and hand sew on all the black silk ribbon trim. Probably 15+ total. First worn: Not worn yet, planned for early next year. Total cost: Black silk taffeta from the stash ($16/yd at about 3 yards) and black silk ribbon at about $30 for all the silk ribbon yardage. Next up - HSM for 2015 is done, and I completed all the challenges, although 3 of them were LATE!! For 2016, I'm not planning on taking part in all the HSM challenges, but I may do a few, I've really enjoyed the historical sew-along, but I need to focus on sewing this year that may or may not fit all the challenges, so we'll see how it goes! Late 18th century black silk mourning cape. 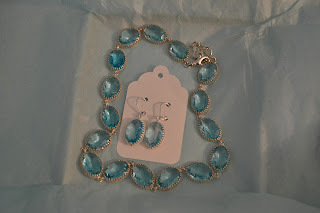 I just wanted to take a minute to share a recent purchase with you: a necklace and earrings set from Dames a la Mode on etsy, for historical costuming! Opening the box is so exciting: folding back the tissue in the gift box and uncovering the sparkly awesomeness. I'm already thinking about saving up for another one. I absolutely love this set! I bought it to wear to an upcoming late 18th century costume event in the spring (and use a bunch in future), but it also went perfectly with a top I wore to a holiday party this past weekend, so I wore it with modern outfit also this past weekend: I love it when costume jewelry can do double duty! Please check out all her lovely jewelry here: and American Duchess & Dames a La Mode are doing a giveway for a $100 gift certificate: wish me luck! How to create a reproduction late 18th century (or19th century) silk muff - muff cover & muff 'pillow' insides, mine made with 100% white goose down! Basically an 18th century silk muff like the reproduction brown & white silk taffeta one below (the first one I ever made, in early 2012, pictured) is made up of two pieces: 1) a muff cover (a tube shaped fashion fabric outside muff cover) that goes over 2) a muff pillow or muff insides (a rectangular shaped muff pillow that is filled with goose down, feathers, down alternative, wool, etc.). First, the HISTORY: I've long been intrigued by 18th & 19th century muffs, or hand warmers: a fashion accessory, whose purpose was also for keeping hands warm, were very popular throughout history. I've seen extant examples or portrait painting examples as early as the 14th & 15th centuries, but muffs were very popular during the Colonial & Regency periods of the late 18th (1770's-1790's) and early 19th (1800-1820's) centuries, and regained popularity again during the late 19th century (Victorian) era, and again earlier this century, in the 1920's-1950's. 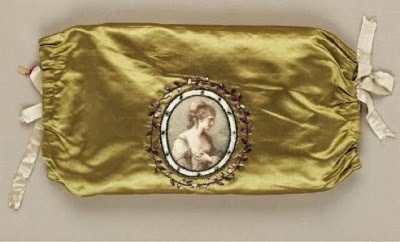 Silk muff cover 1785-1810, Museum of Fine Arts Boston. And a link to my Pinterest board for Muffs of all types and period (up through Edwardian). Muffs came in many different shapes & sizes, made of all different kinds of material, including fur, peacock feathers, goose feathers, wool, silk satin & silk taffeta, etc. The warm insides were comprised of wool, goose & duck down, feathers, and other material that would warm the hands (and was readily available during these eras). This particular muff is based on widely seen extant examples from the late 18th & early 19th centuries, comprised of silk taffeta, silk satin ribbon and 100% white goose down, for wonderful hand warming! I first became enthralled by the idea of 100% white goose down,when I came across extant examples of muffs from museums, that contained down or a down feather blend. Then I found an extant example of late 19th century muff in an antique store: the black silk taffeta was shot, and peeping through was a lovely, luxurious white & grey goose down & feather blend! I was hooked from there! Down is actually the soft cluster that comes from underneath a goose, and contains no hard quills like feathers do. I spent ages searching until I found a reputable down supplier, spent time vetting the company & talking to them to learn about down, and then off I went on my first down adventure! You'll need one piece of fashion fabric for the outside, muff cover, 16" X 20" ~ I suggest a high quality silk taffeta (if you have a thin silk taffeta, you may want to double the fabric together in two layers), but you can also use silk dupioni, silk satin, silk velvet, cotton velvet, wool, cotton, etc. You'll also need about 1 1/2-2 yards of ribbon, anywhere from 1/2"-1 1/2" wide (I use 1" silk satin) for the two side ties, and if you want to trim the muff, you'll need additional ribbon (or self fabric) for that, approximately 3 yards of ribbon for pleated trim that goes around the muff cover 2 times. You'll need two pieces of non-fashion fabric for the inside, muff pillow, 12" X 20" ~ I suggest a fine, very tight weave natural fabric with some satin/sheen, like a fine pima cotton or sateen. Note that down or feathers will push through the fabric if the weave is too loose, so getting a very tight weave fabric is very important. 1) With the muff cover fashion fabric, find the wrong side of the fabric and fold over the ends of the 2 short sides two times each, first 1/4" then 1/2" creating a finished hem. Iron, then sew hem in place (hand or machine). 2) Once the short side hem is in place, fold over the ends of the 2 long sides, two times each, first 1/4" then 1/2", creating a finished hem channel (where you will run your ribbon SIDE ties through later). Iron, then sew the hem channel in place, making sure to stitch along the TOP edge of the hem channel only: be sure to sew as close to the edge as possible, to leave plenty of room in the hem channel for your ribbon later. 3) Insert a 28-30" long ribbon tie into one of the hem channels, pulling through until it comes out both sides about 3-4". Repeat for the second side. Tip*: I like to add an extra inch or two to the ribbon ties, so that I can pull them through quickly and easily with a round-ball-end bodkin (or alternately, you can use a safety pin and work it through by hand), so that when the ribbon is through, you can simply snip off the end or any uneven bits to 'finish' the ribbon SIDE ties. 4) Optional trim: if you plan to trim your muff cover, now is the best time! For the white, pleated trim above: starting about 4" from the hem channel edge, pleat & sew on silk ribbon, going from one side to the other, following the hem channels. Repeat for the opposite side. 5) Match right sides together of short sides, and sew a seam, being sure to catch all trim ends and the like INSIDE your finished seam. I suggest a 3/8-1/2" seam. Iron seam open and turn muff cover inside out. 6) Creating the finished muff: Insert muff pillow insides, drawing up one side using the two ribbon ties, until a big enough opening for your hand to go in and out smoothly, then tie a bow with the ribbon ends. Repeat for the opposite side. Voila, a completed 18th century reproduction silk muff! The finished muff should be approximately 8 1/2" X 13" for the muff cover (tube shape) and approximately 11" by 19" for the muff pillow insides. The muff insides are basically a pillow made of tight weave fabric, then filled with 100% white goose down, down alternative, cotton batting, wool, feathers, etc. 2) Place the two wrong sides facing together and pin all edges, leaving a 3-4 inch opening. 4) Clip corners to remove excess fabric, but leave seam intact – turn inside out and push corners out, creating a pillow to fill. 6) Pin 3-4” opening closed, folding back finished edges to create a finished edge. Roll up pillow and test inside muff cover for thickness (do this BEFORE sewing together the opening, in case you need to add more stuffing or take some out). 7) Sew 3-4” opening closed. Optional – match 12” sides together, right sides together and sew ¼” or less seam allowance, to create a cylindrical pillow. Note: this is not necessary to complete the muff insides, but is optional. Insert muff insides into silk taffeta muff cover. Luxurious 100% white goose down muff insides! Here's the link to my Etsy store 'TheLadyDetalle', if you are interested in purchasing finished muff pillows insides filled with 100% white goose down, down alternative, finished silk muffs, and more! I also have a muff pattern instructions available (digital download or physical pattern) available in my Etsy store. 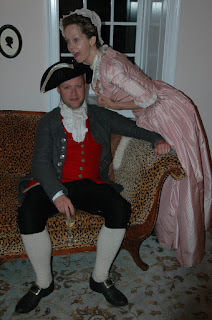 I hope you enjoyed this little blog 'tutorial' on how to make your own 18th (or 19th) century reproduction muffs!! This tutorial is also the muff class I taught at Dress U in Philadelphia in 2012 & again in 2013! Happy Sewing! First, this is a LATE finish of May's HSM Challenge (finished in December) - life got in the way, and I missed three months of sewing and HSM Challenges (April, May & June) so I caught these up albeit late - I did the June challenge in July, and the April and May challenges in December! For my late May Practicality challenge, I am finally getting around to a second long-planned apron! An apron is a woman's accessory in order to do simple things and yet keep her dresses clean: cutting fresh flowers for the house, light baking, or any other simple and yet necessary task, even for a lady (lol). They are also sometimes worn more as an accessory than for any task, so my late Practicality challenge, I created a delicate ladies apron from the late 18th century! The Challenge: Practicality - Fancy party frocks are all very well, but everyone, even princesses, sometimes needs a practical garment that you can DO things in. Create the jeans-and-T-Shirt-get-the-house-clean-and-garden-sorted outfit of your chosen period. Fabric: A Jomar find, $5 a yard I think, and shared 3 ways with friends. Not 100% sure of content, but probably a mixed blend cotton. Year: late 18th century, so 1770's-1780's. How historically accurate is it? It's based on aprons of the time, using similar material and hand sewn. Hours to complete: 1/2 hour to cut and press. 1 hour to sew. First worn: Not yet. I made this for future, and possibly for Fort Fred in April 2016. Total cost: $4-5 for fabric and silk ribbon. I'm happy to get this HSM challenge done, although very late, *sigh*...on to the next one!